After a lacklustre first half, England showed their class to score 35 unanswered points in the second half to win 7-42 in Italy. 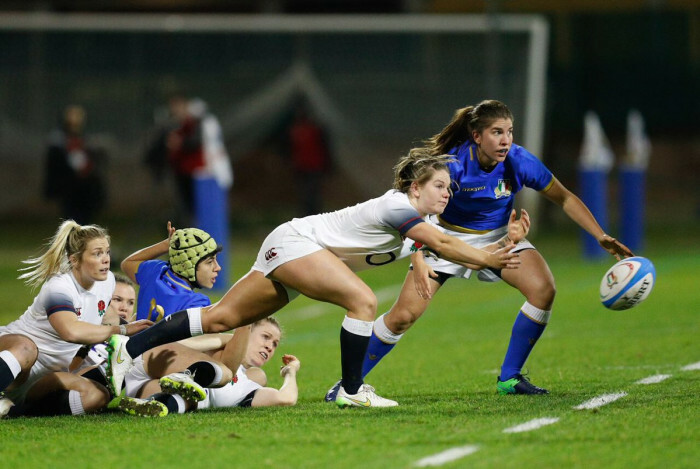 A shock never looked on the cards, even with Italy managing to hold England to a 7-7 score at halftime, and England's power and experience was to the fore in a brilliant second 40 minutes. England's driving lineout proved a threat right from the off and it was from one of those fine efforts that the first score came on 6 minutes with the excellent Sarah Bern getting on the end of a patient shove. Katy Daley-Mclean's passing and kicking game was employed to excellent effect in the opening quarter, but Sara Barratin was equal to her, with the experienced Italian scrum-half helping get her side out of trouble on numerous occasions with her clever kicking game. England were guilty of over playing it on occasion and making far too many errors, and conceded penalties and that cost them when Italy finally got their attacking game going. Building into England's 22, a series of patient pick and drives worked out for Valentina Ruzza who drove under the despairing England defenders to level it up with Michela Sillari's kick going over. But that was as good as it got for Italy as England were a different side in the second half. Italy were effective at the breakdown, where England were forced to scrap for every piece of possession but as the half wore on it was the hosts who built and looked stronger. With Bern coming more and more into the game it looked like England were preparing to open up, and when the first try came through Sarah Hunter, the floodgates opened. Poppy Cleall, who had a fine game on the flank, was next to go over, and Hunter added two more alongside a score from Ellie Kildunne to wrap up a straightforward win. England: 15 Ellie Kildunne, 14 Abigail Dow, 13 Lauren Cattell, 12 Rachael Burford, 11 Danielle Waterman, 10 Katy Daley-McClean, 9 Leanne Riley; 1 Rochelle Clark, 2 Lark Davies, 3 Sarah Bern, 4 Abbie Scott, 5 Tamara Taylor, 6 Poppy Cleall, 7 Marlie Packer, 8 Sarah Hunter (c). Replacements: 16. Amy Cokayne, 17 Vickii Cornborough, 18. Justine Lucas, 19 Rowena Burnfield, 20 Izzy Noel-Smith, 21 Caity Mattinson, 22 Zoe Harrison, 23 Charlotte Pearce.